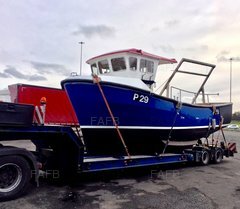 Boat transport Ltd is a small family run business that has over 25 years experience of moving all types of boats throughout the UK & Ireland and many other countries too including France, Spain, Portugal, Sweden and Norway. We have depots in both Southampton and Stourport on Severn so we are ideally placed for hauling your boat up and down the UK and of course catching a cross channel ferry to Europe. We have several low-loader artic boat trailers catering for any size or shape of boat up to 52’ approx. Not only do we move fishing boats but almost any size or shape of other boats too, ranging from 50' sailing yachts and motor boats to flat bottomed canal barges or a catamarans. So, please take a look at our photos for a flavour of the many different types we have moved. Whether you are just buying your very first boat, just fancy an upgrade or need it moving for your holidays, we can help. Our aim is to provide a professional friendly service with the minimum of fuss. We are competitively priced, easy to deal with and you will get a quick response to your enquiry. Please contact us either via email:- info@boattransport.co.uk or Tel. 02380 842022 or 07831 486710. Please have a look at our website www.boattransport.co.uk for further info or to obtain a quote via our easy to complete contact form.